You need full, all day comfortable access to your cell phone. You constantly check Email, documents or Social Networks on your tablet. You want to have your mobile devices within close range at your best viewing angle. Life is running at a fast pace. We can't slow time down for you - but we can help you COMFORTABLE keep your Phone or Tablet within sight and reach. Simply choose where to place our desk stand and marvel in hands-free access to all your device's capabilities. You can now comfortably read on your e-reader from your preferred distance, watch videos with your kids while also tackling small chores. Mount your phone or tablet on the stand and take Facetime and Skype calls, conveniently. Gather around with your friends and take full advantage of your phone's front faced camera! Now it'll be easy to take the most perfect, blur-free group photo, or selfie! It's also great to place it on the floor, to watch YouTube learning videos, during your morning or evening yoga/workout routine! We not only help you make your life easier, but also more stylish. Place this stand on your office desk, your home and even your car - and add a dash of panache! Practically any mobile device is beautifully displayed on our unique stand. TRY IT FOR YOURSELF. Revolutionize your daily life. Click "Add to Cart" Before We Run Out Of Stock! ✔ SMART DEVICES ORGANIZER ON YOUR DESK: You're tired of keeping your hands busy, juggling phone calls, while you need to simultaneously be taking care of other business. Looking for your phone under a pile of papers on your desk. Missing important calls while at home or in the office. Trying to SECURELY PLACE your Phone/Tablet to watch Youtube video while having breakfast or doing morning workout. Our amazing stand-alone Universal Desktop Stand is here to solve all of those problems! 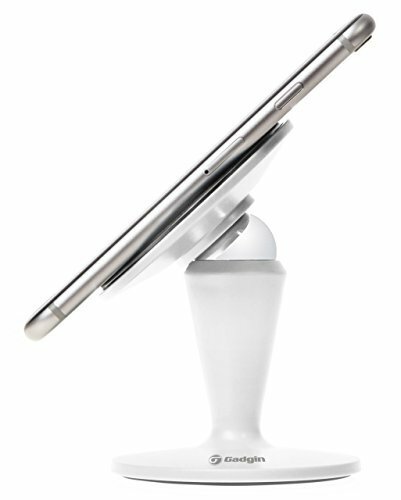 ✔ STURDY, FIRM HOLD: Our stands stay firmly in place - keeping your phone or tablet steady, too. TOP QUALITY: The stand's top and bottom bases are embedded with soft silicone, making it easy to mount your device, whether or not it is cased. The silicone pads ensure no marks are left on your device after use. They also help prevent sliding and scratching. And they're exceptionally easy to clean - just remove dust with water and stand will be ready to use again within seconds! ✔ SLEEK & CONTEMPORARY DESIGN: Our stand's stylish, upscale design, perfectly blends in the modern home or office environment. Select your very own stand and give your phone or tablet a secure yet fashionable hold! ★ [Satisfaction Guaranteed!] WE OFFER YOU 1-YEAR, NO-HASSLE REPLACEMENT WARRANTY - FOR FREE! A stunning gift of 29.95 value. Our warranty is a FREE BONUS with every phone stand purchase. Click "Add to Cart" NOW And Make Your Life Easier with This Unique Phone And Tablet Stand! If you have any questions about this product by Gadgin, contact us by completing and submitting the form below. If you are looking for a specif part number, please include it with your message.